Roz and Lil are the best of friends, and have been since childhood growing up as neighbours in an idyllic beach town. As adults, their teenaged sons have developed a friendship as strong as that which binds their mothers. One perfect summer the boys, along with their mothers, are confronted by the simmering emotions that have been mounting between them. 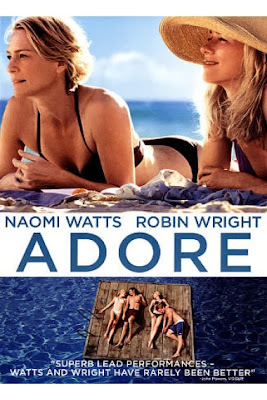 Deeply emotional, ADORE is a story of family, sensuality, compassion, morality and above all love. Wow what can I say about this movie. At first I didn't think this would be a movie for me whatsoever, but as I began to watch it, I found my self not being able to walk away from it. The movie is about two best friends and their sons. Let's just say each friend and the other's son become very close in this movie. Two bonds between friends are forever tied, on all situations, good or bad. The families are torn apart in poor decisions that occur, but the love is very strong and passionate in this movie for sure. To see the boys become just as close of friends as the mothers did was amazing. Each main character does find out that each action that takes place has their consequence. The simmering emotions in this is so crazy that even when you want to stop watching you can't help to see what the next scene will be. The title of the movie fits the story line very well. This movie can have many different opinions on it. I would definitely say to watch this movie and give it a try even if you think it may not be for you. Overall, it truly is a good movie.